Inspired by Nightwish, Visions Of Atlantis nevertheless brings with it a distinct sound, one that combines elements of 'darkwave' with the bombastic sounds of orchestral melodies and the poppy characteristics of power metal. Building upon its MCD Morning In Atlantis (2000) and first full-length album Eternal Endless Infinity (2002), Cast Away consists of nine tracks that combine into a satisfying mix of styles sure to please fans of the 'softer' side of the metal genre. Cast Away begins with Send Me A Light, an immediately Nicole Bogner's vocals come to the forefront. Although not as gifted as Nighwish's Tarja, Nicole holds her own. From the male side comes Mario Plank, whose clean croons match those of Nicole. The track leans toward darkwave, establishing a hypnotic and dark beat while keeping things light with the help of enchanting keyboards and guitar hooks. The title track then changes the musical approach. Cast Awayintroduces bombastic flourishes, but the band relies more on melody than on overt orchestration. Keyboard player Miro Holly has a knack for creating subtle synthesiser and piano sequences in the background that punctuate the harmonious vocals, and this approach really shines on this track. Lost once again changes gears, this time borrowing from dance music to create a poppy, beat-driven song with heavy keys, a driving rhythm section, and sizzling guitars. Realm Of Fantasy breaks out the orchestral superfluities and dives into power metal. The composition brings to mind the sounds of Kamelot and Stratovarius. Guitarist Werner Fiedler manages to hold his own, giving the song a much-needed punch from the six-string axe. Pharaoh's Repentance relies much upon the band's solid rhythm section, with bassist Mike Koren giving the composition a throbbing low end while percussionist Thomas Caser creates some simple but beat-heavy work on the kit. Next up is Winternight, which showcases Miro's abilities with the piano and luscious voice of Nicole. The ballad is enchanting and straightforward, with the background instrumentation (strings and key stings) slight but appropriate. At first, the listener may wonder why the band bothers with the additional flourishes, but when the music surges to full force, with all the instruments flushed with life, the wonder turns to awe. State Of Suspense establishes a darkwave - power metal sound that will get your fingers snapping, and Lemuria comes off as a wide-eyed imagination of a fascinating place. The closer, Last Shut Of Your Eyes, is another ballad, this time led by Mario's power metal-based vocals. 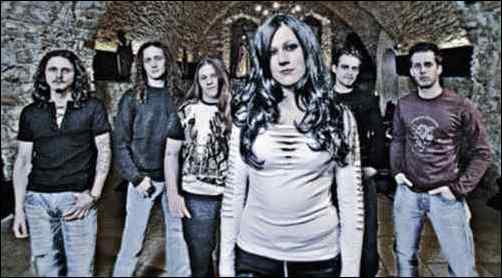 Fans of Nightwish, Edenbridge, and even Rhapsody will enjoy the craftsmanship displayed on Vision Of Atlantis' Cast Away. Power metal is not everyone's cup of tea, but for those who enjoy this musical genre will definitely enjoy this.